We are Iain and Gill; we keep bees naturally in top bar beehives in West Yorkshire. Gill went on a conventional beekeeping course about nine years ago. It was very interesting, but she knew instinctively that it was not right for the bees. Everything was for the convenience of the beekeeper. There was information about the lifecycle of the honeybee, but everything was in the context of bending them to our will. Emphasis was on honey production, diseases of bees, hive construction, inspecting hives frequently and basically interfering in every aspect of the bees' lives. Please note that these pages present our opinions. They are not the views most commonly held by beekeepers, whether commercial bee farmers or hobby beekeepers. They are certainly not the views of the chemical companies or the people they have persuaded for commercial gain. 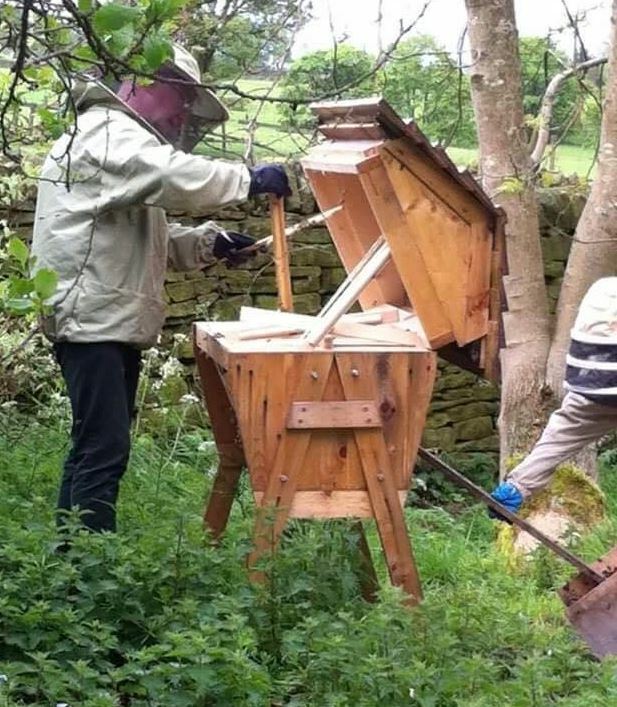 We went to the Northern Bee Gathering and on a natural beekeeping course at Brinscall Hall. Iain was a little worried that he might not like bees buzzing around his head, but though he'd take a chance on it*. We had a beautiful western red cedar beehive made and put it in the garden. Surely a wild swarm of bees would turn up naturally? Unfortunately, no bees moved in during the first year. We got the hive towards the end of June: a little late for the swarming season. The hive was brand new, so smelled strongly of new wood: bees don't like that much. The next year, on Spaw Sunday (a special day in the village where the villagers decorate the wells and visit them in turn, with songs, recitals or poetry at each) we mentioned to a beekeeping neighbour that we still had no bees. That very evening he turned up on the doorstep and said he had a swarm. Would we like it? We excitedly rushed down the road in our bee suits, collected the bees and moved them into the hive. We had bees! The next day he called round again: he had another swarm. Did we want that too? Did we 'eck as like! We put this new swarm into the other end of the same hive with a couple of dividing boards between (a bit like a pair of semi-detached houses). We'd waited almost a year for the first swarm, then the second arrived one day later! Bees can make comb at a fantastic rate and were soon filling both ends of the hive. It was a race against time to get the new hive installed so that we could move one colony into their new home, leaving the first colony enough space to expand. But we made it – just! Bees remember precisely where their hive entrance is, so we needed to keep it in the same place. We moved one end of their hive (the end with their entrance) across a foot or so every week, until it was next to where it had been. The bees got used to each move, so that was fine. Then on the fateful day, we put the hive back to where it had been, and took each of the bars out, complete with wax comb, bees, honey and brood, and put them in the same positions in the new hive, taking photos of each as we went (so we could study them in detail later). As you can see in the photos (click the picture for a slideshow), the bees were actively building comb, and forming chains round the shape they planned to build. They managed to hang on as we transferred them across! When the bars and bees were all in the new hive, we left it positioned so that the entrance was where the old entrance had been, then each week we moved it a foot or so until it was a sensible distance away. Amazingly, it all went according to plan. We'd never done anything like this before, but it was a great success! We have had several more swarms and now have hives in various places. One is a thousand feet up on the edge of the moorland, another in a friend's orchard next to a meadow. One is on a hillside smallholding. Yet another hive sits on a hillside in a lovely garden near Hebden Bridge. We're hoping for a few more swarms (we don't plan to cause any swarms: we leave it up to the bees), and we always have a few more hives ready to offer sanctuary to bees in suitable locations. If you see a swarm or you might have a site for a hive, please let us know. We have twice opened our garden to the village Open Gardens event and talked non-stop about bees to anyone who would listen. As a result several other people have become interested in keeping bees or are more aware of what bees are up against and what we can do to help. Who knows? But it is probably going to involve bees! It is so easy to be fooled into thinking that bees are here to provide us with honey, and unfortunately, most bees are "factory farmed" to produce as much honey as possible. Some beekeepers like to brag about how much honey their bees produced for them. Not us. a colony about to swarm? We won't take any honey in summer: bees build their stocks up to be sure of surviving the winter. They worked really hard for it, so they should keep it. if the bees have some spare honey in the spring, we may take a little of it. But we keep bees for the sake of the bees. Seen a Swarm of Bees? If you are lucky enough to find a swarm of bees, don't worry. Swarming bees are at their most docile and placid. They have no hive to defend. Their stomachs are full of food ready for the journey. Please don't think they need pest controllers: they need a home. Some bees manage to find a place for themselves, but almost any beekeeper will be happy to come and collect the swarm if they possibly can. If possible, please contact a natural beekeeper, not one who will factory-farm the bees. But anything is better than treating them as a pest! You can reach us via the Contact Us page. *The bees proved to be so fascinating that those worries rapidly went away.